The rapidly growing movement to conserve large landscapes has now matured to the point that it has a dedicated organization, the Network for Landscape Conservation, with the mission to document and advance the field. 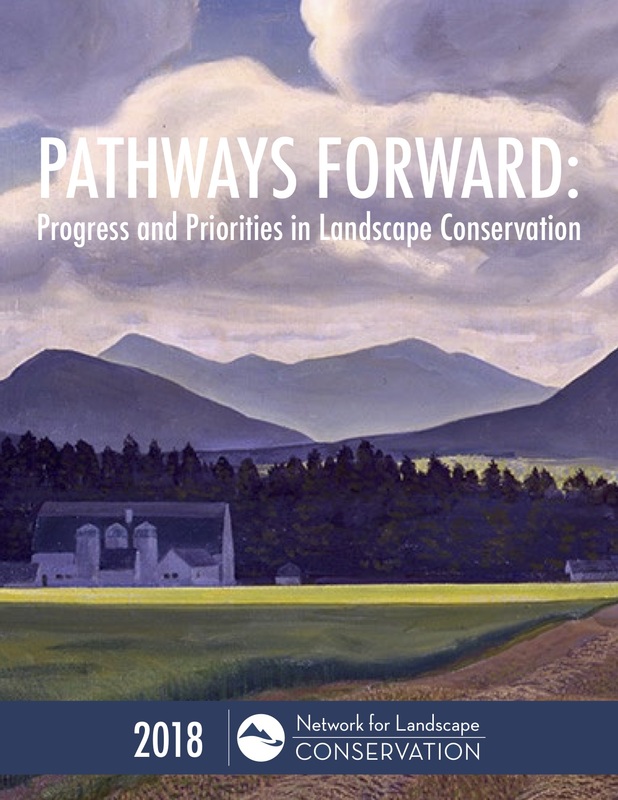 A milestone in advancing this approach is the Nework’s just released report Pathways Forward: Progress and Priorities in Landscape Conservation. The purpose of report is two-fold: to capture the current state of landscape conservation practice; and to suggest what we can do together to successfully conserve our irreplaceable cultural and natural landscapes. It describes the thinking of 200 leading landscape conservation practitioners at a November 2017 National Forum on Landscape Conservation. Today the growth of the movement is measured not just by the increasing number of landscape scale projects, but more importantly by the growing understanding of what it means to successfully sustain them. The new report tackles critical topics such as the need for effective communication, wide ranging collaboration, and targeted investments. It also explores the role of science and the challenge of gaining the necessary support from policy makers. Each of these topics has a chapter in the report that synthesizes the discussions at the 2017 Forum and supplements it with ‘state of the field’ information as well as illustative case studies. As an example, the first chapter on Collaboration charts the necessary elements for a large landscape effort to succeed. It also, and this rang true to me, provided insights on how these landscape efforts might break down. A common failing is not having designated staff support or a ‘backbone organization’ to keep these complicated collaborations moving forward. Each chapter offers a wealth lessons learned as well ground-truthed examples. 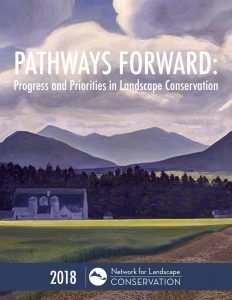 Each of the five chapters conclude with a set of five-year benchmarks that serve as targets, or can we say ‘pathways forward’, for the landscape conservation community. Finally, as the report notes, the stakes could not be higher with a world facing escalating habitat loss and climate change. At risk are the very values landscapes provide to society – clean air, water, and healthy outdoor recreation. Healthy landscapes also deliver such well recognized ecosystem services as reducing the impact of floods and fire, mitigating climate change, improve public health, and safeguarding both cultural heritage and ecological systems. Harder to quantify, but also important, landscapes provide that special sense of place that defines a community and region. So, open up the just released Pathways Forward report and join the Network for Landscape Conservation to stay on top of this fast moving field.